Greg had a very nice comment on yesterday’s blog. Of course, the GoPro videos from behind, with suggestive music, are a little flattering. So he didn’t notice some imperfections that were there. Still, it was a good session. This morning I wanted to do a side video, to get a little less flattering picture and learn something about my rowing. Showing side videos, disclosing the weak points in my stroke, can be quite painful … but I was ready for it. The schedule prescribed fast intervals, and the Masters double that uses the same 6:15am training time had a 15-20x 20 strokes on / 20 strokes off session. I decided to join that. It is always nice to row these things with another boat next to you. So I mounted my GoPro on an old forestay, launched and did a 10 minute warming up. There was pretty strong wind today. The north end of the lake was calm but the south end was a little choppy. About 2 out of 5 on a scale where 0 is oily calm, 1 is slight ripples, and 5 is what our lake is capable of with unfavorable wind strength and direction. We turned around and set off for the tailwind part of the session. During the tailwind we would cap the stroke rates between 25 and 30. 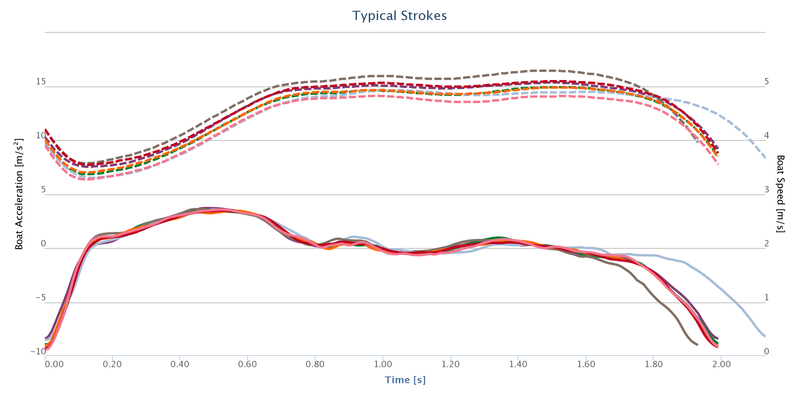 In the second half, the headwind, we would do free stroke rate, which usually ends up in a frantic 36+ spm sprint. I was looking forward to that. Here’s a video of the warming up and the first few intervals. I stayed closer to 30spm than to 25spm, just because it felt right and I wanted to feel the boat run at 30spm and tailwind. Enjoyed that. The second video shows the remaining tailwind intervals. You can see the chop become slightly stronger in each interval. In the last one, the forestay with the camera somehow moves a bit bow-wards. I turned it back but I was slightly worried about the bolt coming lose slowly. Then we turned around and I waited in anticipation of the headwind intervals. Did a few tapdown drills before the double started to move. Then we went off in the first interval. It went well. The only problem was that the forestay moved again, so after this interval I stopped, took my 13mm key and repaired it. It was a quick repair, so the perspective changed slightly. So that was it. Training cut short at 7km and a very painful back. I suspect it was a combination of being slightly off balance due to the weight of the GoPro, which I probably corrected with my trunk. Then, during the choppy part I had to correct even more. That combined with fanatically trying to not lose ground to the double created the circumstances for a muscle or nerve to become angry at me and bite back. Luckily it is not the spine but about 10cm to the right of it and I believe it is just a muscle, not a nerve. After the training I headed straight to the pharmacy to buy a warming gels based on hemp extract. At work I proclaimed that I would be going on the force of Cannabis for the rest of the day. At lunch the pain was maximal, then it started to ebb away. Will take a warm shower in the evening (I have been warned that taking a bath is at the risk of not being able to get out of it) and skip tomorrow’s training in the eight. It was supposed to be a light week anyway, with races planned for coming weekend. Quite happy with the paces achieved. Yes, it was in tailwind, but I wasn’t working very hard, the stroke rate was very controlled and there was some chop. The video blogging turned out to be more painful than I expected, though … Still, looking at the technique, I see improvements. I am much stronger in the second half of the stroke than a year ago. My tap-down is still sloppy and barely visible. Also, I should sit a bit more straight.